The cover of this book is vibrant, and the main character’s hair is cute. The vivid cupcakes and voting sign give you a taste of what’s about to happen in the story. I would have expected the cupcakes to follow the red, blue, and white scheme she uses on some of her cupcakes in the story, but I like the bright colors. The newer cover is softer and looks like a digital illustration. 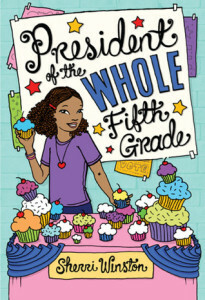 The cover also focuses on the election aspect of the story only without alluding to Brianna’s love for making cupcakes. The second cover seems more focused on one aspect of the story. I wonder which cover made more money for them. Brianna Justice wants to be a multimillionaire and own her own cupcake empire, like her role model Miss Delicious, a celebrity chef. 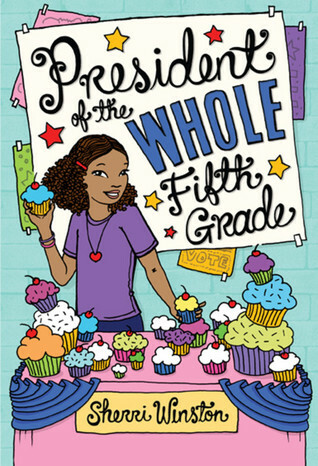 In the fourth grade, Miss Delicious spoke to Brianna’s class, and explained that becoming president of her class, when she was younger, helped her baking success. 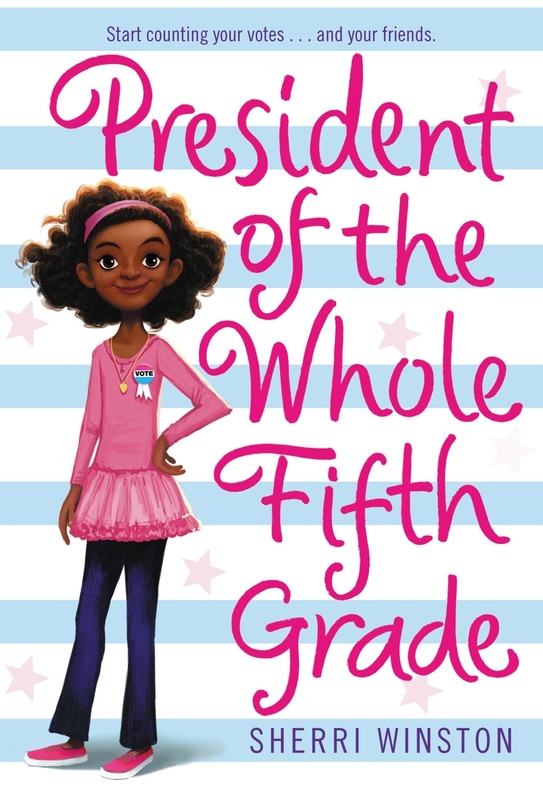 So, all summer long, with the help of her friends, Briana plans how to win the fifth grade presidential election in order to follow in Miss Delicious’ footsteps. However, a new girl name Jasmine Moon, comes to her class and threatens Brianna’s meticulous plans. Jasmine pulls many tricks in order to win, including taking Brianna’s friends from her. Brianna stoops just as low so she can win, but realizes that she doesn’t like the person she’s becoming. Brianna realizes that in order to be the President, she has to win on her own terms. As a result of staying true to herself, Brianna wins the election. Brianna unites all the different children in her class. It’s very charming. Readers also see different personality types of young people, which I also adore. Readers, young and old, will immediately relate to the characters of Brianna’s friends, the popoular kids, and even the ‘weasel‘ that no one wants to be friends with. I also love the mult-generational diversity that Ms. Winston writes in the book. Brianna consults a diversity of opinions, when she needs help. She talks with friends her age, family, and even outside adults to help solve her problems without seeming like a goodie-two-shoes. Ambition – Brianna is an ambitious fifth grader. This book is perfect for identifying goals and ambition, but also knowing when too much ambition is bad. (If that’s possible?) is too much. Money – Brianna and her friends have a whole club dedicated to making money. This is a great book to examine the root of why we want money and how to handle that desire for money. Social Studies – Social study facts are written in the book, so you’re learning. Sportmanship – Brianna has to to behave ‘sproatmanslike’ in many situations in the book, a perfect segue to talk about how to handle situations when you don’t want to be nice. Life Changes – Brianna’s plan, that she spent all summer long planning, doesn’t work when she returns to school. So she has to adjust. Then Brianna has to adjust to this new girl coming in and taking over her friends. Brianna struggles to adjust to change, but is resilient. I love how she overcomes the changes in her life and becomes a better person because of it. 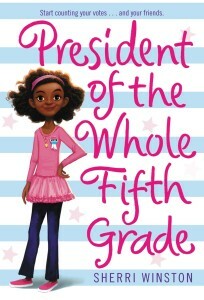 Sherri Winston is a master at capturing the dialogue of tweens. At times, I felt the book was too long. However, the build up to the climax is worth it. I wanted to see Jasmine Moon redeem herself in the end, but we don’t. Maybe she will redeem herself in the next book. 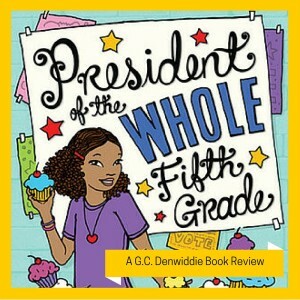 Brianna has to study for a presidential quiz that she competes in as part of the election, so social studies facts are interwoven in the book and offer a mainstream view of history. I wonder how much cooler it would have been has Sherri Winston offer alternative points of view of history regarding US History in the book? At times reading the facts were was laborious, but I think young readers will catch on and learn as they read. Brianna’s preoccupation with money makes me wonder what do our young children worry about? How to be millionaires? Brianna’s family seems well-to-do family and not lacking for anything, so I wonder where this idea of wanting money comes from. Thankfully, Miss Delicious reminds Brianna to enjoy being a kid and that she has time to build an empire. The ending is fitting and makes me want to read more about Brianna, and I think you should too.